couldn’t wait to share with you some things we are making from these fabrics. Not just a normal label/panel fabric! 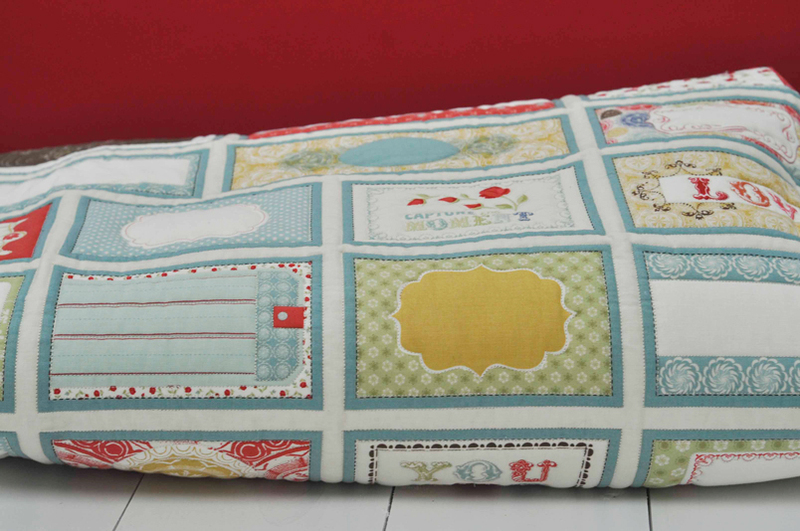 When I saw this fabric I knew it would be perfect for an upcoming wedding as a signature quilt. Sew the panel sections into the size quilt top needed. 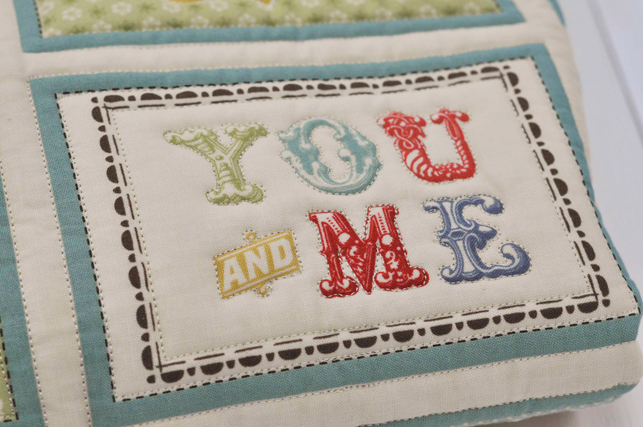 Quilt it. (thank you Judi! ), Bind it and take it to the wedding to have the guests sign the squares making this a treasured keepsake for years to come. 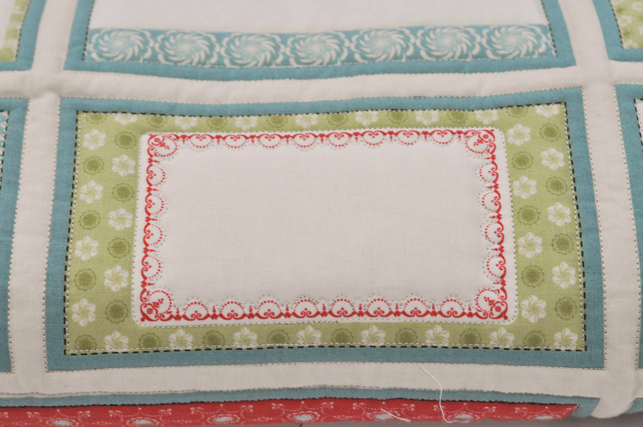 This fabric is perfect for labels but look how cute some of the blocks are in the wedding quilt. Plenty of room for words of wisdom and well wishes. This is the backing fabric and probably my personal favorite fabric in the entire collection. 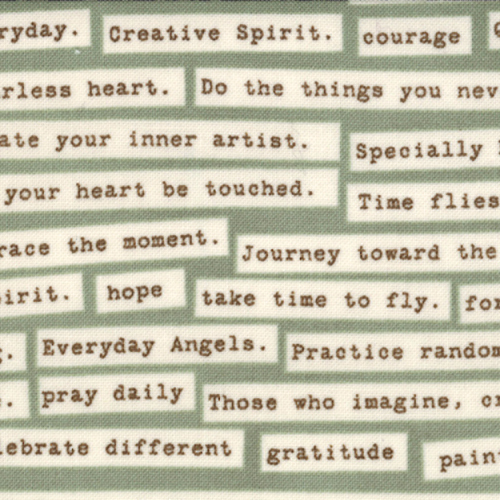 A fabric full of positive, encouraging words. These words should come in handy for any newlywed couple. (perfect for all of us actually) Julie can you make wallpaper like this? Once I saw this new ruler from Prairie Sky Quilting, I knew I had to dive in and make something. Add the Odds and Ends Layer Cake and I knew I had a quick fun project. At first glance you may ask, What does this ruler do that is so different? This ruler eliminates the need to mark your fabrics. Line the solid line on the ruler along the the two corner points and trim. is take it to the machine and start sewing. There is a bonus set of triangles once you have trimmed the block. Easy ! Easy! 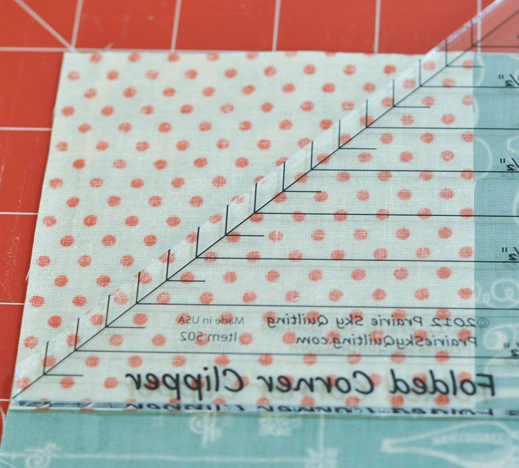 The ruler works on corners up to 5″ so this is perfect for moda’s charm packs also. Odds and Ends by Julie Comstock will be in stores September 2012. Previous Previous post: Sure Guide Threader Winner! Great line I always need some labels ready and the ruler will be added to my collection as soon as I find it ! That ruler looks like it needs to be added to my collection! Truly loving that new line! It will be an amazing addition to any collection. I’m thinking ahead already that it will be…. Hmmm, yep, I love your idea, but also how about gradution signature books, backpacks, You know kids write on anything their friends have.. Oooh the ideas are just endless! 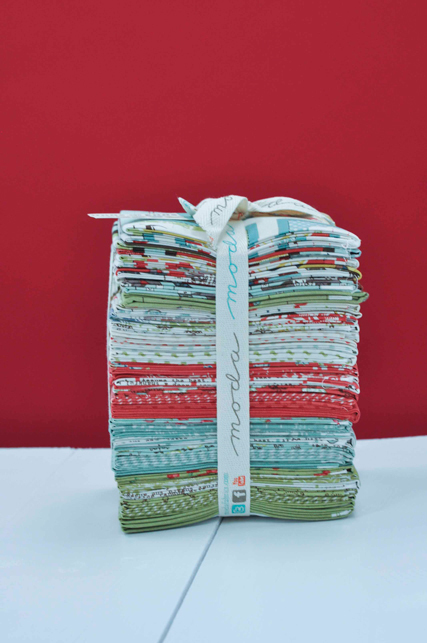 Great tool and fabric bundle! I love the fabric and that looks like a great ruler. where can you buy one of these rulers? ?